On Collaboration and School Culture. Did they “teach” us that one at teacher school? Do you hear it talked about in staff rooms? Do you know what it looks like or feels like? It is like that urban legend you heard about in grade 4, someone’s cousin had spiders hatch out of their cheek while sleeping one night. Yeah that one…the one that scared the pants off of you, even though you never actually met the person. I am not implying burnout is an urban legend, I am saying it is treated as such in teacher culture. Teaching can be a tough job and there is a “survival of the fittest” culture in schools I have worked in. You can admit you are struggling…but only to a point, to certain people and in specific situations; if you show too much weakness others fear you might drag them under. So how does this work if we are going to get teachers to grow, take on big bold risks, and try new things? How to support teachers when parents, critics or even other teachers have a go at what you are doing or trying? Attacks, no matter how well-meaning, can feel personal, consuming the small reserve in the energy tank. Further, if the very adaptations that we as teachers have evolved over the courses of our careers have allowed for our survival how then to change AND not go extinct at the same time? Last year I travelled through a wormhole of change. That I came out the other side is attributable it to one thing: a committed collaborative partner, Graham Johnson. Graham and I, Pikes Peak, June 2011. I have a strong support network outside of school, people who I trust, a husband who is in the biz, but they were not what kept me afloat. What kept me going and stopped me from giving up (cause there were days when I did consider giving up on change) were the continuous conversations that Graham and I had daily, sometimes hourly, about what we were specifically doing. When either of us hit a wall we dealt with it then and there, we brainstormed and co-created a viable solution. We established common goals (we wrote these out on paper) and committed to (even though he teaches Math and I Biology) common ground with certain practices (flexible assessment, Hot Seat, Whiteboarding, Learning Journals are all examples) We communicated via Twitter DMs dawn to late, phone chats and face to face debrief after school. You might be thinking by now…yeah we know that collaboration is important, yesterday’s days news….next. Collaboration is NOT just something you should really try someday and when you do it will be fun; it is like having a snow plow with no blade, a motor boat with no motor, or an axe with no blade. You cannot do the intense work of change without real-time continuous, connected collaboration that relates DIRECTLY to what you actually doing in your class. To collaborate I had to be willing to co-evolve, to commit to a common end (and by this I do not mean improve Grad rates) and at times (more than I might like) I needed to compromise; I had to first converge in the here and now to survive, before I could diverge and thrive later. I used to think that if I controlled everything I could assure the final outcome would be high quality, this was a guaranteed ticket to burnout and was never sustainable. Now I know that through cooperating, compromising and collaborating I can evolve AND survive. If we continue yelling out and waving our arms at teachers: Change this way! Come on let’s go! Pick it up! WITHOUT the collaborative, connected mindset and ecosystem firmly in place, we will perpetuate the medium for burnout. We need to out the culture of “survival of the fittest” and replace with a flourishing visible ecosystem that is fluid, open and dynamic. We need to buoy teachers with collaborative partnerships, collective groupings, tools to connect in real-time and conditions that normalize collaboration as an integral part of the day-to-day. Growing Dreams in the Social Media Landscape. What do you dream of? What do the inner whisperings of your soul say to you? Can you hear them? Are they muffled by what you think you should do or should become? I love big challenging projects that don’t seem to have obvious and immediate purpose. I love to daydream and imagine…the impossible, the really impossible. Since September I have been working with a group of kids (what I call my students) outside of the timetable in a very free-form manner. On the surface and to an outside observer, I am sure it looks like quite a disaster; we meet one morning a week and when we do, it is not like “class”; there are no handouts, no lesson plan, no assignments for marks, no due dates, no projects for the sake of projects, no lectures…no… not a lot of what I was trained and told a good teacher must and should do. When we meet, we all talk at the same time, and in a very non linear fashion; the conversation pings all over the place. Crazy ideas peek out. Instead of playing whack-a-mole, we grab them and embrace them as long-lost friends. We then scatter, like seeds to the wind, and do what we need to do. Each growing our project and seeing what it grows into or if it will even be viable. We ask each other for help and reach out to others beyond our classroom and school. We collaborate frequently via text, phone, email, Facebook and share a Wikispace to create a trail of our musings and dreams. Maybe you think… well… what a waste of time….how random and non-productive. The most wonderous and fabulous thing happened. We imagined a crazy, wild, out-there dream and went for it full-bore. We worked non stop over a 6 week period to put together a project that we hoped would create buzz and interest in Social Media at OKM to create a culture of sharing and connectedness. We envisioned that students might want to connect to something fun and exciting rather be told to be interested in something outdated and stale. Children should dream, a lot, and often. They should know that they can change their world, their community and their school. Not just hope that maybe one day down the road they can hopefully, maybe, if they play their cards right, make some meaningful change. 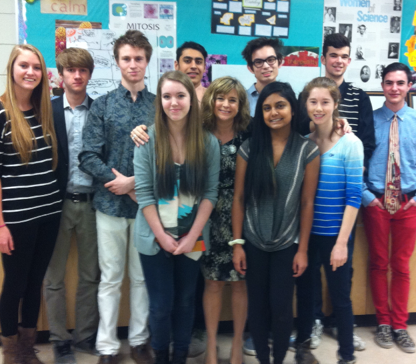 So Thish, Aaron, Stanley, Freya, Spencer, Cam, Harrison, Arpan, and Mackenzie…you are, each of you, the bees knees. Love you guys to bits, up to the moon and back! My heart is full to bursting watching the joy on your faces. Leanne, Mark, Ryan , Ed, Meghan, Keith, Melinda, Cryil, Travis, Kaare, Amy, Jaiden, Rick, Graham, Fausty, Murray, Jenn, Olivia, Karla, Solenn, Katie, Maria, Mr. Skeleton and OKM H. Usky…thanks for supporting and believing in our dream. You ALL made it happen! Making a PED policy for OUR class – together. Check the radiation to pop popcorn! Too funny. Last semester I invited PEDs or personal electronic devices into to my classroom and while it was not perfect, overall there were more advantages than disadvantages. This semester I wanted to improve this experience and enrich our class culture and community. 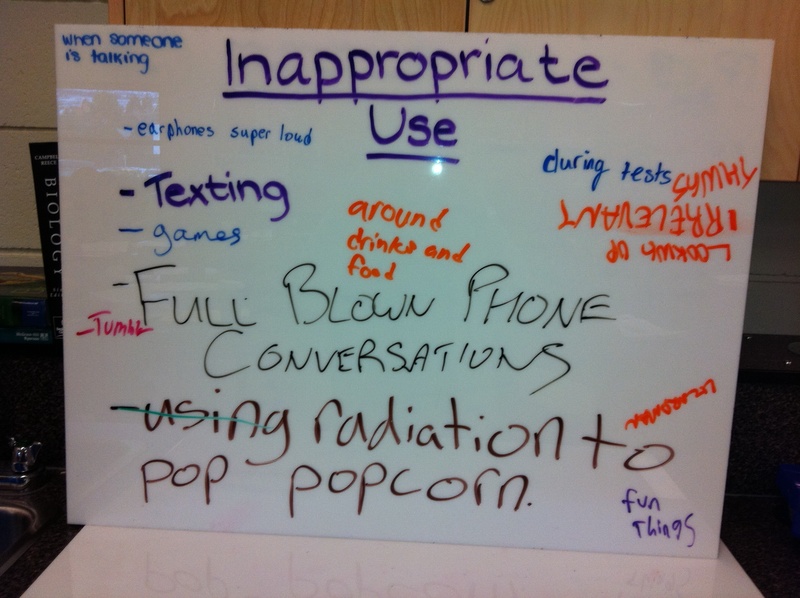 To this end I decided I would ask students to co-create the policy for technology use for our class. 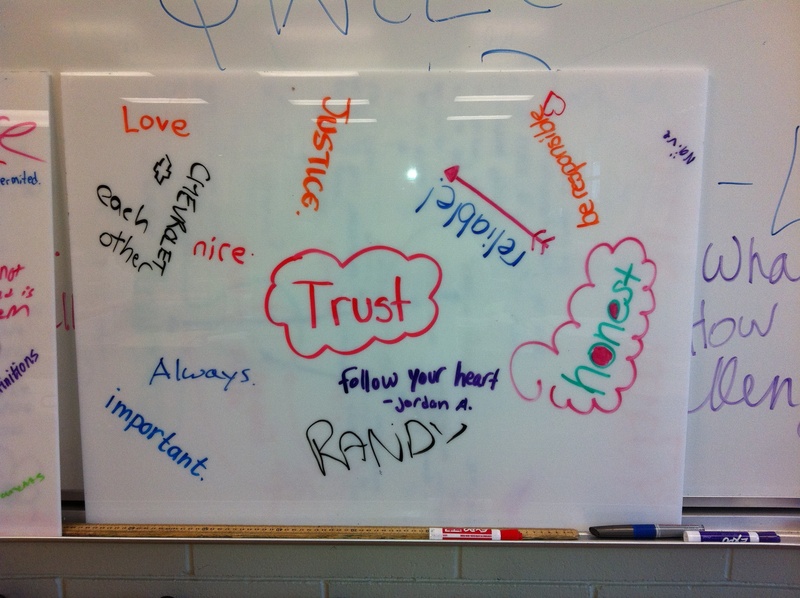 I wanted to include trust in our policy, but it was challenging for students to come up with ideas for. Students then worked alone, and completed the same prompts on a sheet of paper. Next class they shared their points with a partner and worked together to reduce their points down to 3 per question. The partners then paired up with another 2 students, and they again worked together to reduce their points to three per prompt. We then took a class vote on a collective “top three”. 1. While working, when useful for learning, for planning (calendar/list), to look something up, research. 3. When someone is not talking to me. 2. FULL blown phone conversations. While at first I felt slightly disappointed with the outcome (they didn’t sound very officious, and they weren’t that clear), I realized that this policy really rocked! For one it was plain as day that all students has a pretty clear idea of inappropriate use; students really know the way to behave, we don’t really have to tell them in 1000 different ways. I also noticed that students were not really clear on when and how to use their technology, here they were confused and need some help. Student responses from the “Trust” prompt impressed me the most, this only became clear though when we discussed it in class. This process lead me to reflect that students know a lot of good stuff already and are full of wisdom, humour and good intentions. To seal the deal, we all signed the policy and hung it on the wall. Voila! One PED policy done!